Driven by more than 100 maxon DC motors, the shape-shifting multileaf collimator motors focus radiation on tumors while protecting surrounding healthy tissue in sensitive areas of the body. The problem can be a matter of life and death to the patient. Until a few years ago, head and neck tumors could not be safely bombarded with radiation without the possibility of damaging organs like the spinal cord or salivary glands. Doctors were forced to keep radiation doses low – too low to be completely effective in eradicating tumors – in order to avoid paralyzing or even killing their patients. Many spinal column tumor treatments ran the same risks. The situation presented doctors with a Hobson’s choice. A tu-moricidal radiation dose might cure the cancer but seriously harm the patient. On the other hand, lower radiation doses could fail to stop the cancer. Hospitals needed a machine that combined superior technology with an efficient, reliable process for targeting tumors while sparing normal healthy tissues. The components had to deliver radiation in different modes, including segmental, dynamic, combinations of the two, and ‘conformal arc’ radiation treatment, all on one treatment machine. A computer system had to be able to translate multiple views of a single tumor into three-dimensional anatomical images. Using this image data, a complex radiation therapy treatment plan would be created. From the treatment plan, the computer would create the instructions needed to operate the motion system used to provide treatment. Cancer treatment technology from Varian Medical Systems is aimed at being able to ‘paint’ or conform a radiation dose very tightly to a small or irregularly shaped target. These systems have the ability to minimize hot spots, improve target dose homogeneity, and sculpt dose delivery around critical structures more effectively. These systems are used accurately and repeatedly to treat tumors very close to sensitive structures like optic nerves, spinal columns, and other glands and organs. Despite their complexity, the high-resolution treatments are delivered quickly, fitting into the conventional 10- to 15-minute time slots generally reserved for such treatments. The process is further streamlined through DC motor automation and the ability to customize a process, save it, and repeat it. Varian also provides software that incorporates data analysis and reporting tools. Varian has received FDA 510(k) clearance for its latest high-definition multileaf collimator (MLC), an ultra-fine beam shaping device for radiosurgery. The “HD120 MLC” consists of a computer-controlled array of up to 120 parallel, individually adjustable tungsten slats or leaves that can block the path of an X-ray beam. The MLC is attached to the head of the medical linear accelerator, which generates the beam. The leaves of the MLC situated in two parallel rows, and can be moved in and out to create an adjustable aperture through which radiation beams are directed at a patient’s tumor. The shape of the aperture is dynamically changed as treatment progresses, to match the shape of the tumor as seen from each of the angles from which the beam is being delivered. By using the MLC to precisely shape the beams from multiple angles, it is possible to deliver a radiation dose that closely matches the three-dimensional volume of the tumor. The MLC also facilitates intensity-modulated radiation therapy (IMRT). Using the adjustable motor driven leaves of an MLC to shape the beam and by controlling exposure times, clinicians can deliver a different dose to different segments of the tumor, modulating the dose intensity across the entire treatment field. Consequently, the dose can be higher in the most aggressive areas of the tumor and lower in areas where the beam is near or passing through sensitive healthy tissues. Prior to the new HD120 MLC multileaf collimator, Varian’s finest MLC had a central group of beam-shaping leaves that were each 5 mm wide. The HD120 has reduced the width of the central leaves to just 2.5 mm, increasing the beam-shaping precision by 100 percent. Each side of the Varian collimator is configured with 60 leaves distributed in an 8 cm wide central region with 32×2.5 mm leaves, flanked by two 7 cm wide outer regions with 14×5.0 mm leaves, for a total width of 22 cm. The HD120 MLC was also designed for durability, so that it could be relied upon during continual use in a busy clinic. If the leaves are designed too tightly together, they jam. If the leaves are designed too loosely, radiation leakage occurs. Consequently, careful engineering that optimized how the leaves were packaged into the system was critical. The leaves move in and out through the use of 120 tightly packaged DC motors by maxon. maxon DC motors are known for their long life due to their unique construction, and the fact that they are manufactured on specialized machines. Yet, above and beyond their longevity, the motors offered Varian engineers excellent packaging options. Packing 120 DC motors into a 40cm by 40cm space meant that motor size was almost as critical as motor specifications. Through the use of maxon’s Rare Earth 8mm, Rare Earth 10mm and Rare Earth 13mm motors, Varian was able to package 120 tungsten leaves into the limited space available. While the minimotors are indeed small, the truly impressive miniaturization occurred with the required encoder feedback. Each motor has an encoder to close the servo loop that must deliver suitably high resolution while remaining as small as possible in order to meet the packing requirement. Further, these encoders must be modified to be radiation resistant as the high field dose would destroy conventional encoder technology. Gurley Encoders explain motor encoder accuracy. In the world of motion control encoders, the terms resolution, accuracy and repeatability are often confused. Definitions: This document refers to rotary encoders because they are more common than linear encoders, however information can be extend to linear encoders also. The resolution is a measure of how many counts per unit distance the encoder generates, or, the size of the measuring step. With rotary encoders, resolution is expressed in either units of angle (degrees-minutes-seconds, decimal degrees, grads, or radians) or in number of measuring steps per revolution (e.g., 10,000 counts/rev). [PPR, or pulses per rev, is quite common, but we avoid this term on purpose. Often, when a binary number of measuring steps per revolution is required, the term “bit” is used to indicate the resolution’s highest power of 2; for example, a 16-bit encoder generates 216 = 65,536 counts/rev. Resolution is a basic encoder parameter. Accuracy is a measure of where the encoder says it is as apposed to where it actually is. They are expressed as units of an angle, although sometimes also expressed as electrical degrees. Accuracy and error are expressions of the difference between actual and reported position, However with a slightly different meaning. The accuracy is the difference between the indicated reading and the true position. Error is how far the indicated position is off true.The higher theaccuracy is better. The resolution of an encoder is fixed on the electronics or the optic wheel when the encoder is made however, encoder errors can crop up later with influences from temperature, shaft loading, service life and dust. The number of counts per revolution does not change unless in the case of severe damage. Accuracy effects all encoders but not all manufacturers specify it. The reported position over time is expressed as repeatability. Instrument Error + Quadrature Error + Interpolation Error + Quantization Error = Total Optical Encoder Error. Phasing and duty-cycle tolerances is Quadrature Error It is usually expressed as electrical degrees or an angular measure. Interpolation Error is the error in an electronically increased value. Quantization Error = the characteristic of a digital instrument. To measure encoder accuracy it is possible rotate the encoder at a controlled speed and measure the time interval between transitions of the output. The classic way to measure position errors is with an autocollimator a multi-faceted mirror that attached to the encoder shaft. 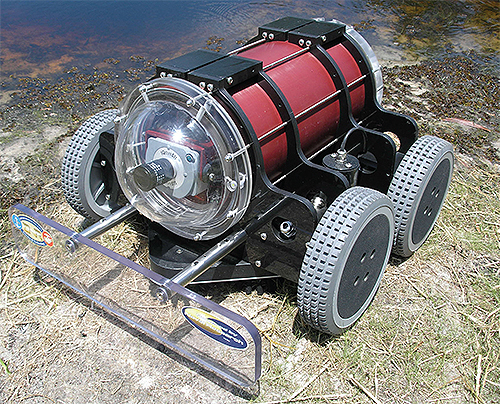 New design Servo gearmotors have enabled a Florida company to design a robotic crawler that can navigate around the underwater portion of a ship and remove accumulated biofilm layers. As DC motor and battery operated, autonomous vehicle, component selection made up a highly critical part of the design and manufacturing process. Toxic paint is used on the bottom of large ships to prevent biofilm growth, a form of fouling that increases the ship’s drag and decreases efficiency. Although it is quite effective, the downside is that the toxic paint continually leeches copper and other heavy metals into the underwater environment and damages the organisms that live there. To make the matter more complex, the paint must be blasted off and replaced every 5 to 10 years, at which time tons of toxic waste is produced and must be properly disposed. A ship that operates with a clean underwater surface free from fouling—even thin biofilm layers—will operate so much more efficiently that potential savings can easily reach over 5% in fuel costs alone. Without the concern for fouling, a ship’s underwater coating can be engineered for corrosion protection and longevity rather than its need to eliminate the potential for biofouling. If biofilm fouling was eliminated on all the ships operating in the world today, the energy savings would greatly reduce the presence of greenhouse gases. To eliminate the requirement for toxic paint and its cleaning waste, there needed to be a method to “groom” the biofilm from the underwater portion of a ship. The idea was to create important changes for the ships being built as well as for the environment. That is where the HullBUG (Hull Bioinspired Underwater Grooming) concept originated. Successful promotion of the HullBUG servo concept by SeaRobotics, Palm Beach Gardens, Fla., attracted the attention of the U.S. Navy and specifically The Office of Naval Research (ONR). A successful proposal was submitted to the ONR for funding and a project team was established. The team currently uses SeaRobotics as a system designer and integrator and the Naval Surface Warfare Center Carderock Division (NSWCCD) as the team manager. The Florida Institute of Technology is also employed to provide it’s strong system knowledge and research base for understanding how the biofilms affect ship efficiencies and what is necessary to combat them. “The most important feature of the HullBUG is its small size,” says SeaRobotics’ Research Engineer, Dr. Kenneth Holappa. “It is only about half a meter in length.” This was a necessary design feature to allow the vehicle to maneuver over the curved surface of the hull while continually maintaining close contact with the surface. An additional benefit of the small system size was that it allowed a single operator to deploy the vehicle without the use of additional equipment such as a crane. Because of the hazards associated with operating such a device underwater and in a harbor environment, occasionally a HullBUG might be lost or destroyed during operation. Keeping the size and cost of the system low definitely helped to eliminate damage as a major obstacle to implementation. So, from the very beginning of the project, small size and low cost have been identified as being critical to the satisfactory implementation of the HullBUG project. As can be expected, this need to maintain a particular size and weight filtered into the selection of every component of the servo system design. The selection of the DC gear motors to drive the HullBUG involved a number of critical engineering constraints and compromises. SeaRobotics decided to make two basic models, one with wheels and one with tracks, and offer several options for monitoring the system’s progress. Motor sizing, for example, required a calculated estimate of the power, speed, and torque characteristics of the manufactured devices. Determining factors included the resistance caused from pushing the grooming tool across the surface of the ship, the hydrodynamic resistance of the vehicle itself as it moved through the water, friction losses in the shaft seals that were used to protect the motors from the saltwater, and track or wheel friction dependent on which version of the unit was used. “After extensive component research, we chose to use Maxon DC motors and gearheads,” says Holappa. “Their motors not only provided a very cost effective solution, but they were highly efficient and extremely simple to implement.” The company used EC flat motors with planetary gearheads. Two brushless DC motors were used on the tracked version of the HullBUG (one for each track); while four brushless flat motors were needed for the wheeled version (one for each wheel). An additional EC flat motor was implemented in the grooming tool. That motor used a simple spur gear for speed reduction. In addition, a final motor, connected directly, was used for the negative pressure attachment device that held the HullBUG in place. The EC45 4-pole flat DC motors selected for the HullBUG are very efficient and weigh only 0.997kg. Continuous output power is 200 W, while the maximum speed is 12,000 rpm (much faster than what was needed for this application). The important specification for this application was torque. Even under the potentially harsh environments in which the HullBUG would be engaged, the EC45 had a maximum continuous torque up to 37 oz-in. (265 mNm), depending on the winding chosen. The Maxon brushless motors are built to IP54 standards, which was critical to the application. Furthermore, the motors are also available in the system DC voltage that SeaRobotics requires for the HullBUG application. According to Holappa, the large load capacity of the shafts of the GP42 gearhead let the wheels mount directly to the gearhead shaft, which greatly reduced the complexity of the overall system design. Because the HullBUG vehicle was to be completely autonomous, it had to be designed in such a way as to operate for many hours on batteries (cables would simply get in the way of the grooming operation). In order to maximize battery life, the biofilm grooming had to be done in the most efficient manner. Navigating in a random pattern may eventually get the job done, but not in a reasonable amount of time. In addition, a typical ship presents a very large underwater surface, often as much as 3000 m2. To keep this amount of area groomed, a user could employ multiple HullBUG vehicles to operate at the same time using sophisticated coordinated navigation. Navigating the HullBUGA toolset of navigation modes has been created to let mul-tiple HullBUGs efficiently groom a ship by dividing the ship’s underwater surface into regions. Numerous algorithms have been incorporated to groom the ship accurately in steps down to the curve of the bilge. Additional algorithms and associated sensors are used to control efficient grooming on the flat bottom of the ship. Miniature acoustic ranging sonar (MARS) is also an option for navigation control of the HullBUG. This is where a small, close-range pencil beam sonar was specifically developed to let the vehicle “see” an upcoming wall or cliff condition such as bilge keels and bow thrusters. Yet another mode of navigation uses a MEMS rate sensor for navigation information. Another feedback mode uses encoder-based odometry. Hall sensor feedback from the motor is used as an encoder signal to establish an accurate estimate of odometry. Hall sensors were used instead of optical encoders because of size and cost. The Hall sensors provide better than 1-mm accuracy in the measurement of odometry with the motor and gearhead combination chosen. An autonomous vehicle is often software heavy in terms of engineering effort after having selected and implemented the proper motion-control system. Obtaining smooth, reliable navigation maneuvers that result in accurate positioning in a widely varying environment was one of the more difficult challenges for the design team. Multiple layers of software were necessary for handling the number and variety of possible events that can occur during grooming. Also, the proper organization of the control logic to allow extensibility of navigation behavior was the most difficult part of this complex system. “Software development will continue to be an ongoing effort even after the years already put into it,” says Holappa. “Though the vehicle is completely operational, there remains a considerable amount of on-ship testing to be done.” As the project moves forward and into the field, there will no doubt be additional issues that will crop up and need to be addressed. Even now, the vehicle must be able to accomplish its task reliably in a hostile environment and in an unmapped terrain. Then it has to be able to return to the waterline of the ship for retrieval. This operation must be done repeatedly for days, months, and years, and with multiple systems in the water at the same time. Although this sounds as though it is overly difficult, according to Holappa, a technician was recently trained to use the vehicle and was fully competent in a short time. The user interface was borrowed from the SeaRobotics’ Unmanned Surface Vehicle (USV) product line, an intuitive graphics-driven interface that has logged hundreds of hours of use by many different customers. The next primary focus will be structuring the interface to improve ease-of-use and let non-engineering personnel manage operations. Not only DC motors, but also Education. maxon does not only produce DC motors for the Mars missions, but also publishes technical literature. The author, Dr. Otto Stemme, was born almost 70 years ago. He studied physics, earned his degree in Jena and did his doctorate in Munich. As a young Doctor of Physics he began his career at the Institute for Magnetic Materials in Jena and with the Study Group for Storage Technology at the German Academy of Science in Berlin. He later worked with the AEG-TELEFUNKEN Research Institute in Ulm. In 1970 Mr. Stemme moved to maxon in Sachseln, Switzerland. Later he changed to the photographic industry as person in charge of quality control at the Rollei Works in Brunswick. Then, for the Agfa-Gevaert Group he became the Manager of the Research and Development Division for Photo Technology. At the height of his career Dr. Stemme was Chief Executive Officer of the Durst Phototechnik GmbH in Bozen. 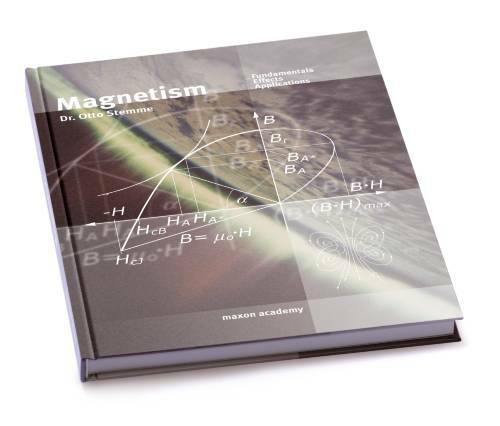 The book “Magnetismus” is a result of Mr. Stemme’s wide knowledge which he has made available even after his well earned retirement. Mr. Stemme has created an unequalled scientific work. He has succeeded in making his wide knowledge available for future generations and in concentrating a very extensive topic into one book. The book works with simple examples, with estimates and even with approximations. The aim is to cultivate basic understanding and to offer assistance for feasibility calculations and considerations. The book has three chapters. Initially basics and terms are explained, then there is some theory on magnetism and finally the magnetic circuit and magnetisation procedures are dealt with in detail. Due to their proximity to drive technology, magnetic forces are dealt with at length, as are magnetic field sensor technology and natural magnetic fields. The book is available from maxon motor Australia for $50.00 including postage and handling. DC motor motion stability and dynamics – and this all on a servo driven ball? Motor control experts have impressively brought to reality what sounds, at first, kind of crazy and appears to contradict most basic laws of physics. Their Ballbot1 “Rezero” accomplishes not only a balancing act on the ball, but equally impresses by its convincing technical servo solutions, unprecedented control agility and appealing design. As a focus project of the Federal Institute of Technology, students of the Autonomous System Lab along with their fellow colleagues at the University of Applied Sciences and the University of the Arts have formed a cooperation of a special kind. The result of this collaboration is named Rezero, being the first motor driven Ballbot that not only perfectly masters balancing on a ball via motion control. It also exploits its movement potential and shows that a robot can look appealing without bystanders needing to overcome their inhibition threshold. As motorised tour guide, servant, assistant or as toy, Rezero feels comfortable when space is limited or in crowded places. It is a most-talented artiste and entertainer, it impresses, unfolds emotions and interacts with persons standing nearby in a very impressive way. One obvious attribute of a Ballbot is the „ball“ on which it stands. Its contact area to level ground is actually a single point, making the robot generally instable by design and highly at risk to keel over. On the other hand, this fact enables free movement in any direction as well as the rotation around its own axis. Another aspect: Rolling in a particular direction produces counter torque – the tilt of the robot in opposition to the direction of motion – in turn, would actually make it tumble. But, a Ballbot makes use of this fact as it slightly leans in the opposite direction to, quasi, chase behind its center of gravity. To further accelerate, the Ballbot lets itself fall even further in direction of travel. For deceleration however, additional motor acceleration is required to first “out-compete” its center of gravity before coming to a synchronized standstill in the fully upright position. Yet; total “standstill is the Ballbot’s death“. Even when appearing standing erect, it equilibrates by continuously slightly revolving the ball underneath its center of gravity. An obstacle to be overcome is the actuation of the ball itself: A „normal“ motor driven wheel rotates radially around its own axis, either forward or backward. Yet, a movement in the wheel’s axial direction can only be achieved by overcoming the friction. Applied to the drive of a ball it means that, when moving in one direction, at least one of the drive wheels will radially jam. This fact requires the employment of a multi-directional motor drive system. Thereby, so called omniwheels2 take care of load transmission in one direction, while simultaneously providing free-wheeling in the other direction. 2 Multi-directional wheels that work like “normal” wheels, being capable to transmit force in radial direction. In axial direction, they feature self-rotating elements capable to freely turn under axial load. The ball is a project-own design that distinctly differentiates from other approaches. Its structure and the consequently required manufacturing process have been made-up in collaboration with an industrial partner. It is based on a geometrically highly accurate aluminum hollow sphere covered by a 4 mm thick rubberized, low-wear surface providing a very high coefficient of static friction. Both factors, precise spherical shape and high friction result in supremely quite running, extreme dynamic acceleration capability, and high velocity of up to 3.5 m/s (almost 13 km/h, that is close to 8 mph! ).Most other known Ballbots travel somewhat “out of the true” and seem to stand out rather by their sluggishness and slowness. 6 Positioning controller with 700 W power output, operating voltage 11…70 VDC, output current (continuous/max) 10/25 A, slave within CANopen network Stability and Dynamics – and this all on a Ball? Current control mode, being addressed as slaves within the CAN network. The three drives are being coordinated by the real time low-level computer. The drive system impresses by its remarkable maximum dynamics during acceleration and deceleration, high velocities and, at the same time, high-precision positioning and quite running. In control are two data processors; a real time low-level computer for fast, accurate equilibration and position monitoring, and a high-level processor in Linux running the Robot Operating System (ROS) which takes care of interaction with the surroundings. Rezero can be controlled by various input methods, such as joystick or trajectory planning via MATLAB. Additionally, Rezero features a “game mode” by which, within preset parameters (such as, for example, maximum speed, acceleration, range of movement), a group of people can take control by jostling and tapping it. The Inertial Measurement Unit (IMU) represents one of the robot’s core components. The system measures translative and rotatory accelerations, as well as spatial tilt angles and features a compass. Data are being smoothened by an internal Kalman filter and transmitted to the low-level computer. The unit operates at a frequency of 160 Hz and represents the clocking link within the regulation chain. To perceive its surrounding, Rezero is equipped with various laser and ultrasonic detectors. Their arrangement allows full 360° detection of objects within a range of approximately 6.5 m (21 feet). Depending on the selected mode, detected objects are assessed as obstacles, or they can be incorporated in the robot’s behavior. Thus, for example, allowing Rezero “to take chase”. 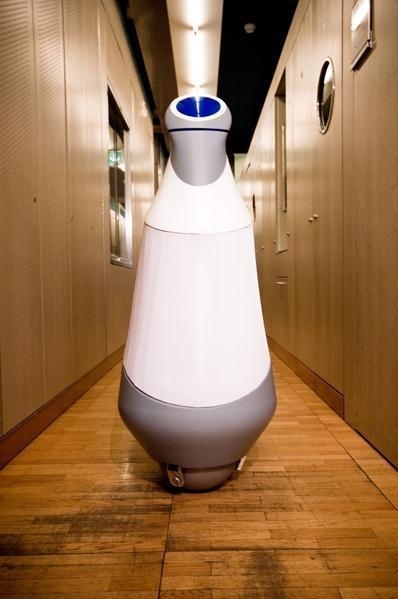 The sensory capabilities are being enhanced by surround microphones, whereby their signals can also be integrated into the robot’s actions. Kids (and not just small ones!) can hardly resist the temptation to touch the robot, to play with it or to bring it to heel. Not just due to its incredibly organic movements, but also because of its very friendly, inviting appearance. The kinetic behavior reflects also in its exterior packaging; curved, nicely shaped, of strong character, dynamic and elegant. Rezero it the first Ballbot that not only perfectly commands the act of balance, but also outbids the moving capabilities of a Ballbot in an incomparable manner. The project team’s well-elaborated concept impresses: The successful in-house development of the mechatronic elements, the high grade design and the interdisciplinary total package solution make Rezero an outstanding eye catcher. Hence, it does not come as a surprise that Rezero has attracted the attention of renowned companies in the film and entertainment industry. In the near future, Rezero for sure can be admired by a large audience when performing at its best. As part of their Bachelor studies, students at the Swiss Federal Institute of Technology Zurich (ETHZ) have gathered in a focus project to develop a multiparite articulated crawling robot. It’s name is the agenda; because Traloc is acronym for “track” and “localisation”. Hence, it is already said how the robot moves – just as in a tractor crawler’s track – and the purpose it is being used for – localisation and detection of buried or trapped persons. What if the search for survivors could be performed by a robot that would be remotely controlled through the scene of devastaion from a safe distance? How can the risks for on-site rescue teams be minimalised? How can the critical, truly limited timeframe following a quake be used most efficiently? How can trapped persons be pinpointed with high accuracy and how can communication with survivors be established? These and similar questions were the team member’s particular focus. And their answer is not bad at all: Trapped victims can be buried under metres of debris. Localisation and rescue can be a high risk and time critical endeavor, thus demanding the utmost from victims and rescue workers. In this exceptional situation, vibration-free but at the same time rapid and precise localisation of a victim is crucial for an effective rescue. because the probability of survival decreases very rapidly over time. That’s where Traloc comes in. It is designed to explore hard to reach, unstable terrain, to detect signs of life and to perform precise detection and localisation tasks. The project focuses on theoretical feasibility and possible implementation of a rescue system capable to support and supplement known, well established rescue methods. 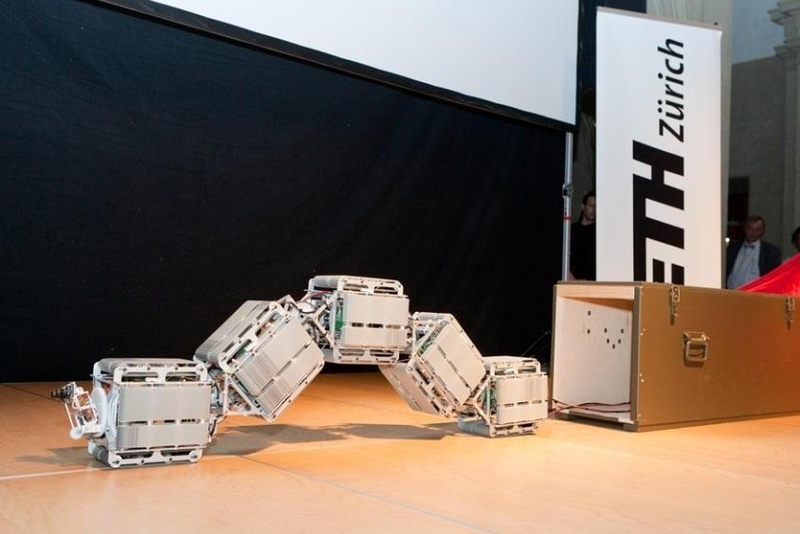 Traloc is a modular system, which currently comprises five autonomously propelled, self contained base elements. Each of them features a central drive system that propels tracks on all four long sides to guarantee forward motion regardless of the spatial orientation. Two base elements are thereby interconnected by concept comprises a microcontroller for each base element. It manages propulsion and deflection of the corresponding base element, as well as communication with the other microcontrollers in the system. To provide even higher capabilities, the modular design allows the Traloc’s extension with additional base elements. Foundation stone of the Traloc is a set of self-supporting, cuboidal light-weight structures of about 200 mm side length, each. They are constructed as self-contained modules and provide space for the drives for the tracks and the joint, associated electronics, sensors, and interfaces. The elements are equipped with a pair of tracks on each side which are simultaneously driven by the central drive system. At their front faces, they feature a freely movable, motorised gimbal joint. The track pairs along the sides of each base element are made of double toothed belts. They are simultaneously driven by a single motor via a central worm reduction gear with four output shafts – another development of the Traloc team. This drive principle has the advantage of being capable to dependably move the Traloc, regardless of its actual contact faces. Sensor-based monitoring was deliberately not used. maxon motor’s EC 32 flat IE, brushless flat motors with integrated 1-Q speed controller serve as main drives. One of the mechanical core components is an innovative , self-designed joint. The idea is based on an actively powered gimbal joint permitting a deflection angle of more than 45° in both planes. The two degrees of freedom are mechanically decoupled, making it easy to control and very robust against external impacts. Each degree of freedom is actuated by an electric motor via a two stage chain reduction drive. In addition, a contactless rotary angle sensor is used to accurately position the joint. Each axis is driven by a brushless DC motor EC-max 22 with a downstream planetary gearhead with ceramic components GP 32C and a 1-Q-EC servo controller DEC Module 50/5. The modular setup of the system bears great potential for the implementation of sophisticated algorithms for specific control of the individual base elements. In order not to stress the project’s very restricted timeframe too much, complex motion control has not been implemented with the present prototype. Nevertheless, alternative options could be demonstrated in detail. Traloc features an interface, by which rotating angles of the individual intermediate joints and driving speed are transmitted. For the drive control, a number of methods, such as trajectory planning via MATLAB, a graphical control console or the pioneering self-designed “snake controller” are available. With the latter, the operator holds a miniturised model of the Traloc in their hands. The desired changes in the shape can be determined by adjusting or moulding the individual limbs of the “snake controller” against each other. The driving speed is preset with a slider control. The Miniature Traloc’s deviations are then flatened and sent as parameters to the corresponding controllers of the base elements, thus recreating the form and position of the “snake controller”. The control parameters are transmitted via trailing cable which also hosts lines for energy supply and for data transmission of the robot’s onboard environment sensing instrumentation. An inertial measuring system is located in the middle base element. It monitors the Traloc’s spatial orientation and transmits the data on location, position, and geographic orientation to an extrenal CPU. The data is then used to determine the position of pinpointed victims as well as for calculation of the Traloc’s safe returning path. Originally, provision of all the base elements with individual inertial measuring systems was planned, but could not be implemented due to lack of time. Can you believe it is just 8 weeks until the end of the year! Starting stock take today to prepare for December eofy. Student teams from ten of Australia’s top universities recently competed in the inaugural National Instruments Autonomous Robotics Competition, a student competition focused on inspiring student innovation in the field of robotics. The winners of the 2011 competition were Team SUAVE from Swinburne University of Technology in Victoria, with Team RMIT CRITTER from the Royal Melbourne Institute of Technology taking out second place. Maxon Motor provided each team with a voucher for the purchase of precision motors and Team Suave used maxon motors and controllers in their winning entry. Team SUAVE received a winner’s prize of $3,000 with Team RMIT Critter receiving $1,500 for second place, in addition, all teams that successfully competed on the day will maintain ownership of the competition development kits provided by National Instruments, which included NI LabVIEW and an NI CompactRIO embedded acquisition and control system. “We were thrilled with the efforts of all the competing teams in the inaugural NI Autonomous Robotics Competition” said Mark Phillips, marketing manager for National Instruments Oceania. “Our competition winners, Team SUAVE from Swinburne University, completed all the defined tasks in just over three minutes; a fantastic achievement given that we had allowed up to ten minutes for each team. “Additionally, every team had a unique approach to the development of their autonomous robot. “We can’t wait to see how the competing teams in the 2012 competition build on the innovation demonstrated this year”. The competition tasks and objectives required students to demonstrate their skills in the robotics application areas of navigation, object handling and obstacle avoidance by developing an autonomous robot that would complete a set of predefined tasks in the shortest amount of time at the live competition, and ultimately earn them the most points. National Instruments provided each team with a development kit featuring NI LabVIEW graphical system design software and a CompactRIO embedded acquisition and control system required to enable the development and control of their autonomous robot, as well as training and mentoring for all the students.